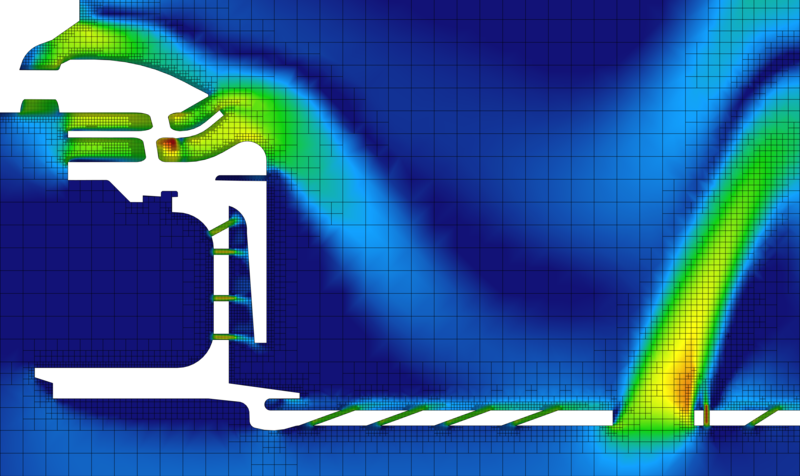 Gas turbine combustion is a complex process, and it can be a challenge to achieve accurate and reliable CFD simulation results at a reasonable computational cost. Computational efficiency requires appropriate mesh resolution (an overly coarse mesh will fail to capture important phenomena, while excessive refinement will increase the computational cost) and turbulence, spray, combustion, and emissions models that provide an appropriate level of detail. 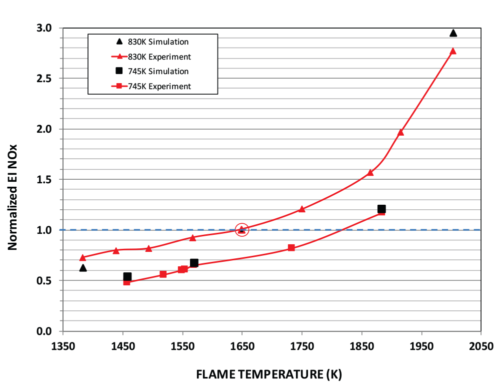 The need for efficiency often leads to the use of simplified combustion models that are accurate only after extensive tuning of model parameters (i.e., postdiction instead of prediction). CONVERGE CFD’s powerful tools—including its fully coupled detailed chemistry solver, Dynamic Mechanism Reduction (DMR), automated meshing, and Adaptive Mesh Refinement (AMR)—provide the accuracy needed for predictive simulation (in other words, no tuning is required) and the efficiency needed for reasonable runtimes. You can use CONVERGE to solve the full chemistry details instead of reducing them to look-up tables or empirically tuned combustion variables. CONVERGE can accurately predict important kinetically limited gas turbine phenomena such as ignition, flashback, and lean blow off (LBO). In addition, you can investigate the combined effects of chemistry and turbulence and obtain information about key combustor performance parameters. 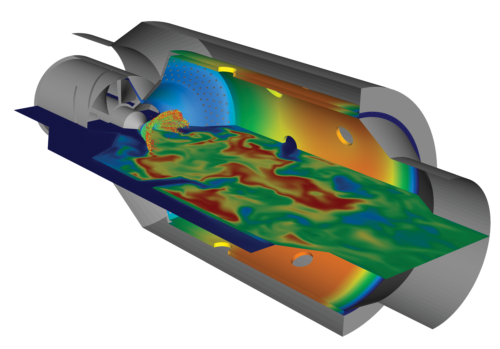 CONVERGE CFD moves gas turbine combustion simulations from the postdictive to the predictive. CONVERGE models ignition and flame propagation (relight) with an accurate representation of the spark energy, volume, duration, and flame kernel formation and propagation. This accurate spark modeling, combined with detailed chemistry, provides accurate ignition and flame propagation modeling for combustor high altitude relight. 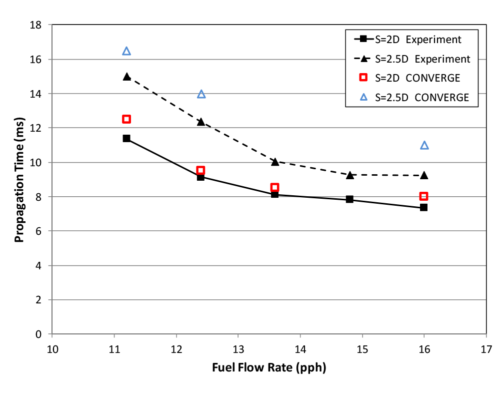 Effect of fuel/air ratio and burner spacing on relight propagation time. (experimental data from University of Cincinnati ASME 2015-42509). Lean blow off (LBO) is a critical combustor performance factor for lean premixed systems for the energy and transportation industries. LBO is often the limiting factor to reducing flame temperatures and thus inhibiting NOx formation. Simulating the LBO behavior of a combustor and fuel design is critical to improving performance and safety. To obtain accurate LBO results, it is important to avoid simplified or tabular combustion approaches that remove the chemical accuracy during non-equilibrium events such as LBO. In CONVERGE’s detailed chemistry solver, you can include a mechanism that contains the medium-temperature ignition reactions that are important to LBO phenomena. CONVERGE can predict LBO for both gaseous and liquid fuels. 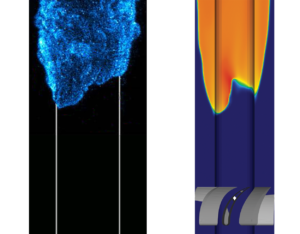 Flashback modeling of the H2/CH4 flame (Left: University of Texas experiment; Right: CONVERGE simulation). Lean premixed combustion systems that are tuned for low emissions operate near a condition at which the flamespeed of the fuel can overcome the flow velocity and flashback occurs. Flashback of premixed fuel/air systems can cause damage to personnel and equipment. CONVERGE’s accurate detailed chemistry solver coupled with its accurate representation of flow turbulence allows you to predict the effects of operating conditions and fuel composition on flashback. 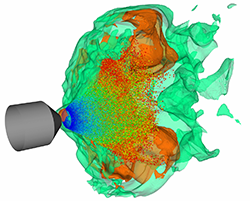 Liquid fuel simulations of aviation and power gas turbines are easy and robust thanks to a wide variety of spray modeling options in CONVERGE. CONVERGE contains accurate models for all steps of the spray process, including primary and secondary breakup, filming, splashing, coalescence, and collision. Injected sprays can be defined by a drop size, size distribution, spray velocity, and cone angles. You can use the popular Rosin-Rammler or Chi-squared log normal distribution, or you can fit the distribution to your cumulative distribution curve. Your simulation can include multiple injectors with multiple nozzles per injector. You can inject different fluids or fuels from each injector. You can also model primary and secondary breakup via the KH-RT model, which is common for high pressure jet atomization. Atomization and spray flame modeling. 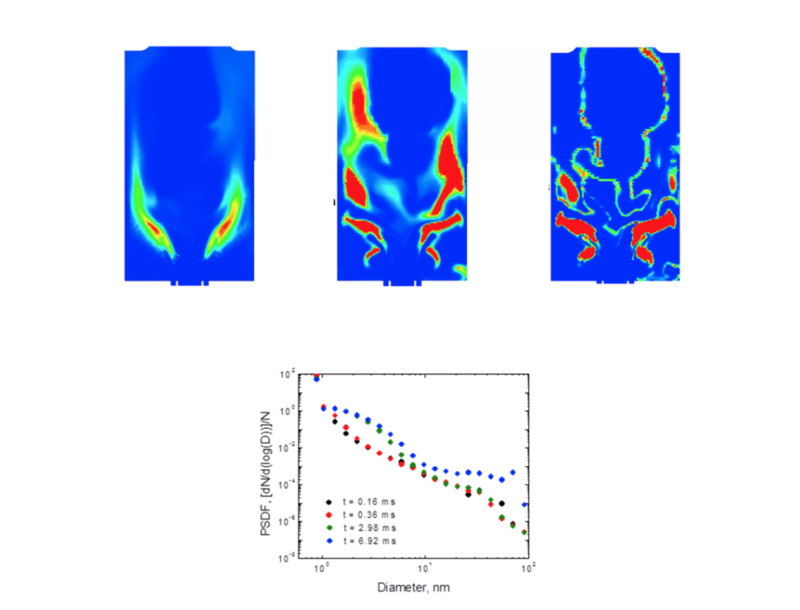 CONVERGE includes an Eulerian volume of fluid (VOF) modeling approach to simulate regions of high liquid volume ratio such as the inside of an atomizer. 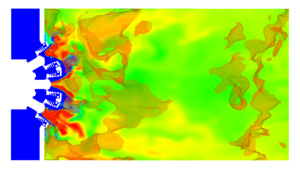 In addition, CONVERGE includes a coupled Eulerian-Lagrangian model in which a VOF model is used in the regions with high liquid volume fractions and then those results are passed directly to a standard Lagrangian simulation in the combustor. Emissions of pollutants such as NOx, CO, and soot (particulate matter) are a critical design consideration for gas turbines. CONVERGE offers several approaches to predict emissions from combustion. For low load or power conditions, you can predict NOx and CO emissions via CONVERGE’s detailed chemistry solver. The detailed chemistry solver directly calculates the pollutant species such as NO, NO2, and CO from an accurate fuel mechanism. This approach increases accuracy, especially in ultra-low, single-digit NOx emissions in which simple post-processing of thermal NOx (Zel’dovich) does not account for prompt and third-body NOx formation. Another benefit of this approach is that modern fuel mechanisms have NOx sensitization and reburn kinetics that can be important to rich burn-quick mix-lean burn (RQL) systems. NOx emissions for Parker Hannifin LDI Combustor. For high power, stable applications, CONVERGE offers the fast Flamelet Generated Manifold (FGM) combustion model. For simulations that invoke the fast FGM model, you can use a passive NOx calculation (similar to NOx post-processing) that contains the extended Zel’dovich thermal NOx and prompt NOx formation. Soot emissions from gas turbine combustors are increasingly becoming a critical design factor as new particulate matter emissions regulations extend from flying aircraft to the tarmac. CONVERGE allows you to take advantage of a new era in soot modeling with soot particle size and size distribution predictions from multiple precursors. CONVERGE offers the traditional two-step Hiroyasu soot modeling mechanism in which soot is formed in a single step from a single precursor (typically acetylene) and then oxidation is modeled with another single step. However, accurate results from two-step soot models can require significant empirical tuning against experimental data. CONVERGE also offers two advanced detailed soot models from Professor Fabian Mauss that take advantage of detailed chemistry and model soot formation from multiple precursors and oxidation pathways. The Particulate Mimic (PM) model provides the average soot particle size and number density based on the method of moments. The Particulate Size Mimic (PSM) model provides information on the particle size distribution based on the sectional method. (Top: PM model; Bottom: PSM model). The fidelity of the component geometries is critical to accurately simulate complex phenomena inside the gas turbine. CONVERGE allows you to go from CAD to CFD with a seamless approach in which you have full control over the mesh. Automated meshing means you never have to make a mesh again. CONVERGE’s automated meshing creates an accurate grid for even the small, complex portions of the geometry (such as passages through swirlers and effusion cooling holes). Adaptive Mesh Refinement increases the mesh resolution when and where it is needed throughout a simulation. CONVERGE will optimize the cell count to maximize accuracy and computational efficiency. It is easy to change the mesh size in small passages in the geometry to understand what grid size is required for grid-convergent modeling. CONVERGE’s automatic grid scaling is a time-saving feature that uses a coarse mesh initially to reduce the time required to reach a fully developed state. This tactic avoids the necessity of running a steady-state RANS simulation before running an LES simulation. Often CAD geometries have defects or are dirty. This is no problem for CONVERGE, which offers CONVERGE Studio‘s robust surface wrapping capabilities and surface mending features to fix problems while maintaining the full accuracy of the original geometry. Surface wrapping easily and efficiently fills holes in dirty geometries. Mending the surface helps to maintain the component fidelity while making setup as straightforward as possible. Wrapping the surface easily and efficiently fills holes in dirty geometries. CONVERGE Studio’s geometry tools also make it easy to switch geometries or import a new geometric element. Adaptive Mesh Refinement in the narrow passages in the swirler and effusion cooling holes. Click for full-size image. CONVERGE’s innovative super-cycling approach to conjugate heat transfer (CHT) allows you to investigate lifing while bypassing the typical challenge of different time-scales between fluids and solids. You can use super-cycling in your CONVERGE simulation to effectively couple combustion simulations with CHT to predict combustor wall temperatures with shorter simulation times. Accurate CFD predictions of combustion and hot section part temperatures require fully coupled combustion and metal simulations. Traditional CFD tools often struggle with coupled flame and metal temperature simulations due to the relatively slow response time of the metal compared to the gas. CONVERGE supports fast and accurate prediction of combustor wall temperatures with CHT, which captures flame shapes, cooling flows, and metal thermal conditions. With super-cycling, the temperature and heat transfer history over a period of time is applied to the metal, which allows it to quickly reach a statistically steady-state temperature. Conjugate heat transfer on a combustor wall with combustion. Aoki, K., Kobayashi, K., Takase, H., and Ishikawa, M., “Simulations of Film Cooling with Cut Cell and Adaptive Mesh Refinement,” 46th Annual Meeting of Gas Turbine Society of Japan, C-2, 2018. Bravo, L., and Acosta, W., “Comparison of CFD Predictions of Hydrogen/Methane Lean Direct Injection Gas Turbine Flame Tube – Temperature and Species,” 53rd AIAA/SAE/ASEE Joint Propulsion Conference, Atlanta, GA, United States, 10-12 July, 2017. Abstract submitted. Bravo, L., Xue, Q., Murugan, M., Ghoshal, A., Walock, M., and Flatau, A., “Particle Transport Analysis of Sand Ingestion in Gas Turbine Jet Engines,” 53rd AIAA/SAE/ASEE Joint Propulsion Conference, Atlanta, GA, United States, 10-12 July, 2017. Abstract submitted. Wang, Z., Wang, Z., and Zhong, X.., “Gas Turbine Combustion Simulation with Automatic Mesh Generation and Detailed Chemistry,” 2015 IDAJ CAE Solution Conference, Beijing, China, November 23-24, 2015. Omote, H., Hirota, K., Hotta, T., Kumar, G., and Drennan, S.A., “Combustion and Conjugate Heat Transfer CFD Simulations to Support Combustor Design,” 2015 International Gas Turbines Conference, Toyko, Japan, November 15-20, 2015. Kumar, G., and Drennan, S., “Simulations of the Effect of Velocity Ratios on an Effusion Cooled Combustor Wall with Adaptive Mesh Refinement CFD and Conjugate Heat Transfer,” AIAA Propulsion & Energy 2015 Conference, Orlando, FL, United States, July 27-29, 2015. Kumar, G., and Drennan, S., “Coupled Transient Combustion and Combustor Wall Temperature with Adaptive Mesh Refinement CFD and Conjugate Heat Transfer,” 9th US National Combustion Meeting, Cincinnati, OH, United States, May 17-20, 2015.